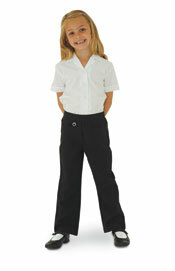 Junior Boot Leg Trousers. Stretch Polyester. Front Panel Pockets. Elasticated waist at back. Sizes available: Age 3-4 to 9-10. Inside leg: 16'' to 28''. Colours available: Black, Navy, Grey.